'Infinex lumina #4', from Sydney Ball’s recent 'Infinex' series, builds upon his modular works of the 1960s. 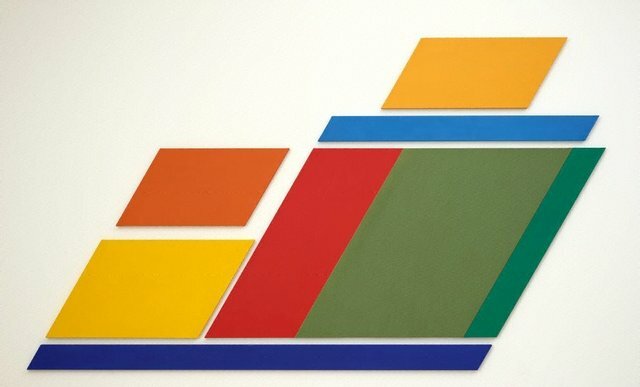 It presents a number of shaped canvases in a deliberate arrangement on a white wall. The individual shapes relate to each other in various combinations, both in terms of their form and colour. There is an exquisite subtlety of saturated and vibrating colour, which produces a poetic optical effect. Ball’s work was pivotal to the development of a decidedly Australian version of international colour-field painting. In 1968 it was shown in the landmark exhibition 'The field', held at the National Gallery of Victoria and the Art Gallery of New South Wales, the first comprehensive exhibition of Australian colour-field painting. Signed and dated upper r. verso large red/green panel [part c], black fibre-tipped pen "... 2010/ Sydney Ball/ ...".